The first Sunday night football game of the season is going to be spectacular, even if Tom Brady won’t be a part of it. Granted it might have been a little more difficult to predict if he were the starting quarterback, but this just makes it a lot more exciting. As we all know Brady gave up his legal battle against the NFL and will serve his 4 game penalty, I bet Jimmy Garoppolo is grateful for the opportunity to finally start in a game for the team he has been part of for the last 2 years. Now the Patriots enter this game as underdogs, a situation that doesn’t happen very often, a lot of critics say Garoppolo won’t be able to hold his own and the only thing they can hope for is that he doesn’t hurt the team too much during these next 4 weeks. However, he could end up surprising a lot of people; Garoppolo looked pretty good in his first two preseason games, granted he did lost some ground in the third game, but he connected 36 out of 50 passes with no interceptions, not bad if you think about it, and he won’t be playing alone, he has the entire team behind him. And this is no ordinary team, this is a team that went 12-4 last season, so not all is lost for the Patriots. 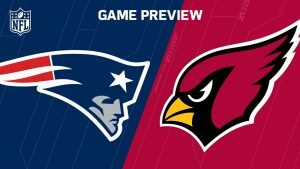 Bad news for New England though is they are playing against the Arizona Cardinals, a strong contender for this year’s Super Bowl. They ended last season at 13-3, with their quarterback Carson Palmer ranking third in the league with a total of 4671 yards and 35 touchdowns, this guy is a power house, but it doesn’t end there, Arizona has a great offense with players like David Johnson, considered one of the best receiving backs in the NFL and with good reason, last season he accumulated a total of 581 rushing yards with eight touchdowns in addition to his 457 yards in the air. Defensively the Cardinals were great last year but this year could be a game changer for them with the addition of former Patriot outside linebacker Chandler Jones, last season while he played with New England he raked a total of 12.5 sacks, it almost seems unfair for the Patriots to have to face the Cardinals in week one, but that’s life. As much as I would like to give Garoppolo my support, it is just impossible to ignore how strong the Cardinals are this year, I strongly feel they have the right team assembled to take them all the way to the Super Bowl this season. Their killer offense coupled with a much stronger defense will make them the team to beat, and for this reason I have to give this win to the Cardinals, my prediction is Cardinals win 27-17. Make sure to place all your NFL bets with plenty of time at Ace Sportsbook.